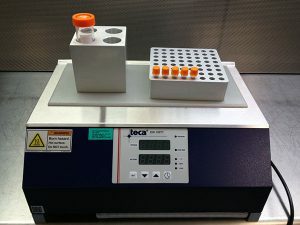 Using TECA’s Dual Cold/Hot Plate, a health psychology lab in a large university is conducting a study on the relationship between pain sensitivity and inflammation in human subjects. 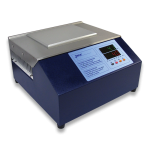 The human subject places his or her hand on the surface of TECA’s AHP-1200DCP Dual Cold/Hot Plate for a period of time. 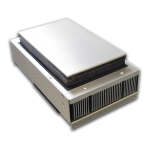 Researchers are using set points between 52 °C and -4 °C and can utilize the included communications software to program ramp and soak profiles. 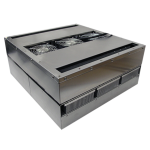 TECA’s model AHP-1200DCP consists of two adjacent thermoelectric heat/cool plates (dual zone cold plate). 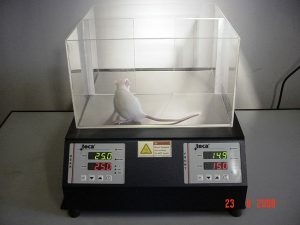 In this example, the customer has added an optional Plexiglas barrier that allows the rat to easily move between the two surfaces. 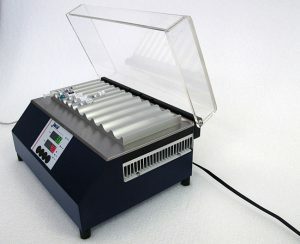 One plate was set at 30 ºC and the other plate was alternately set also to 30 ºC or to a different temperature. Animals spent time on each plate. 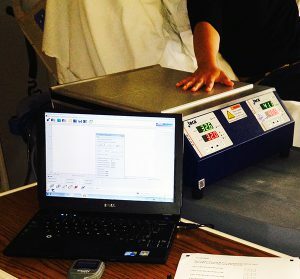 The customer studies whether rats/mice exhibit a significant, temperature-dependent avoidance of plates after injection of analgesic drugs. 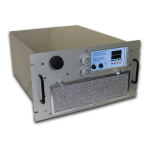 Investigating the changes in behavioral responses due to changes in experimental floor temperature and dermal application of heating/cooling compounds in an animal model requires precise temperature control system. 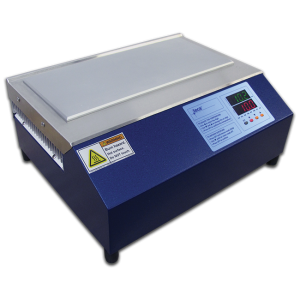 The TECA AHP-1200DCP dual zone cold/hot thermoelectric plate with two independently controllable temperature zones provides precise regulation of the floor temperature and change of settings as deemed. experimentally necessary. 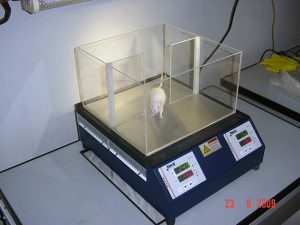 The Plexiglass arena allows careful monitoring of animal activity while allowing the animal to roam free across the experimental surface. 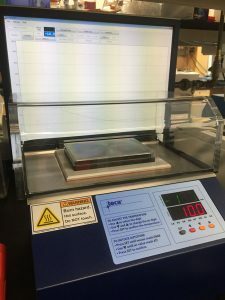 Some researchers at Johns Hopkins have taken the AHP-1200CPV thermoelectric cold plate (Peltier cold plate) and are cooling protein crystallization in Teflon trays with a solution in them. They’ve used the remote sense feature by drilling a hole in Teflon tray and installing the sensor in there. Using it with internal sensor and the auto-tuning feature they have gotten the control they needed. 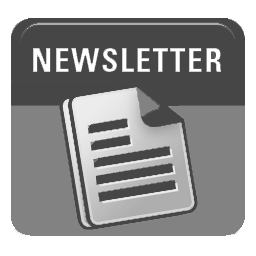 The secret may have been in how well the Teflon tray is contacting the 2″ X 3″ plate, machined perfectly flat. 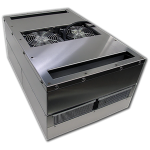 Cooling objects with concave bottoms minimizes the contact area and diminishes the cooling effectiveness. 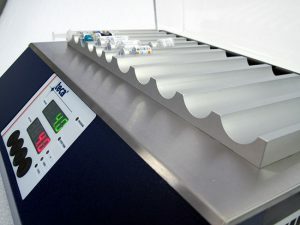 Keeping medication at optimal storage temperature is very important. 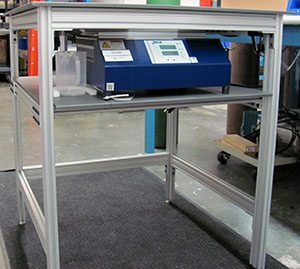 A customized AHP-1200CPV thermoelectric cold plate (Peltier cooling plate) with plate that has grooves with various diameters to accommodate vials of different sizes and lengths was a perfect solution for the customer. 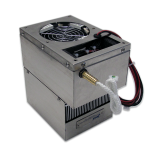 Another feature of this custom thermoelectric cooling unit (Peltier cold plate) is tamper proof temperature controller. 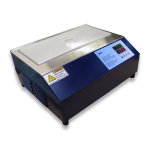 Our customer calls the ICE-160 Electric Ice Trays a “dramatic improvement”. He uses several in his medical practice. 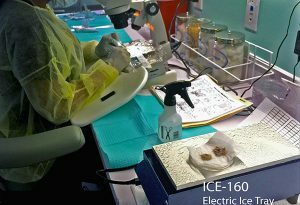 From our customer: “We use the ICE-160 during the quality-control and graft-storage portion of our minimally-invasive hair transplant procedures. While hair transplant grafts are outside of the body, they are fragile and susceptible to damage from dehydration and other factors as they are separated from their blood supply. 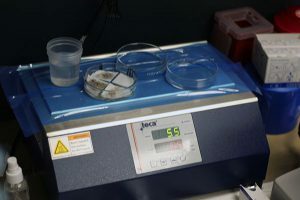 During this delicate phase of the hair transplant, the harvested follicular unit micrografts are now in a special physiologic holding solution at 4 °C using the thermoelectric ICE-160 before and after being counted and sorted and while they are awaiting implantation. This is a dramatic improvement over the use of traditional graft coolers using frozen water which need to be swapped out often during a long NeoGraft FUE hair transplant procedure. 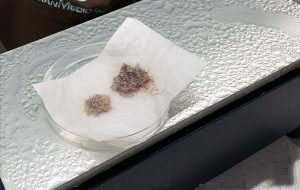 A group of physicians pioneered a hair replacement procedure using TECA’s AHP-1200CPV Cold/Hot Plate. 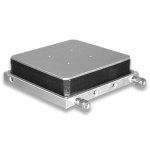 The AHP-1200CPV is a Peltier cold plate. 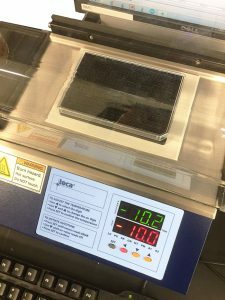 In the photo provided by TECA’s customer, the cold plate keeps hair transplant grafts cool in a solution during the patient’s procedure. 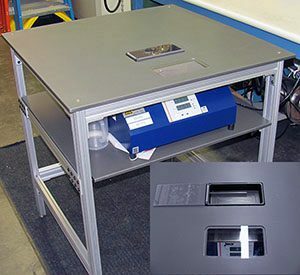 The convenience of the AHP-1200CPV cold plate’s built-in temperature controller allows the technician to easily program it to maintain the desired set point. 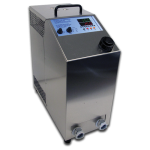 The AHP-1200CPV is capable of reaching temperatures as low as -15 °C. 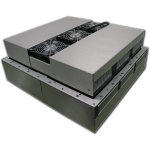 In the photos here, the set point is programmed to 5 °C. 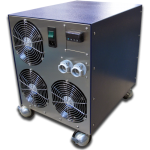 The AHP-1200CPV has an integral universal power supply, so it can be used with any input voltage range from 100 to 240 VAC.